from each State for Referral Services! I am writing you this letter in an urgent attempt to reach you. I would like to hear from you within seven days, so I hope this letter reaches you at an opportune time for your immediately reply. Our goal has always been to accommodate businesses with the services needed. We are currently seeking professional services: Attorneys, Accountants, Financial Services, Computer Specialist, Marketing/Advertisement, Consulting Services, Management, Secretarial Services, Restaurants/Catering, Real Estate, Professional Cleaning Services, etc. The National Portal will refer businesses, which are in need of professional services to our participating businesses. 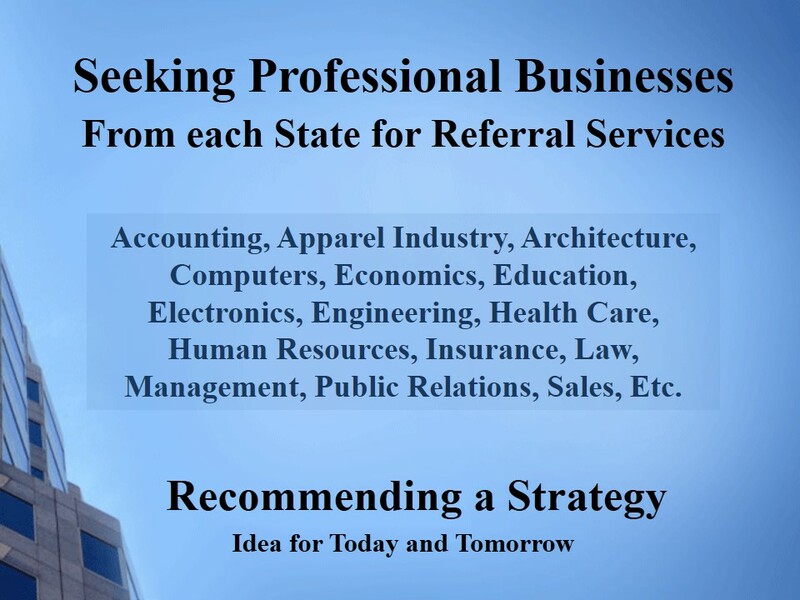 We need at least 20 professional businesses in each Maryland County to meet the demand for our Referral Services. The extra benefits you will receive for participating in our Referral Program: . · You will be listed in our Professional Referral Program for one year. Act now our Referral Program will cost $250.00 annually. If you respond immediately, all you have to pay is the $59.00 registration fee. We believe that our Referral Program is a win win opportunity for participating professional services, The National Portal, and most importantly to participating businesses and customers.